First thing I noticed was Uche Iwuji with a 20 inch shabby blonde wig that exposed her black edges underneath. This chick has got to be one of the shabbiest messes in Nollywood… Eiwoooo! This film is about a family torn apart by sheer greed. Thompson has bitterness in his heart after finding out that his mother had her subsequent children with men other than his father, and as such despises his mother, brother and sister. His main aim is to kill off his grandfather and acquire his wealth. He employs the help of a “fake nurse” to do this. When his grandfather dies, he as the oldest son assumes his wealth and coldheartedly banishes the whole family to poverty. From here there was a whole plot twist that I won’t go into. More than being intriguing or exciting it was downright confusing. I would say that the film is watchable if you have already bought a copy, but if not I would advice you not to bother. The actress that played the secretary that both brothers were after was so excruciatingly wooden. I am wowed! Seriously, i am glad i came here. You are da bomb my dear. 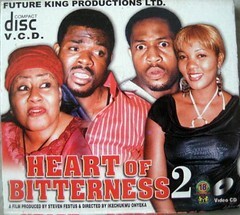 With more critics like you around, the quality of Nollywood films will increase. And thanks for stopping by. Your write ups are highly inspiring and i urge you to continue because it will not only expose our weaknesses but will encourage us to greater heights. I will be glad if will oblige me a visit to my blog and make your contribution to my movie related questions. What do you think about my role as Donald in "Secret Pain"?